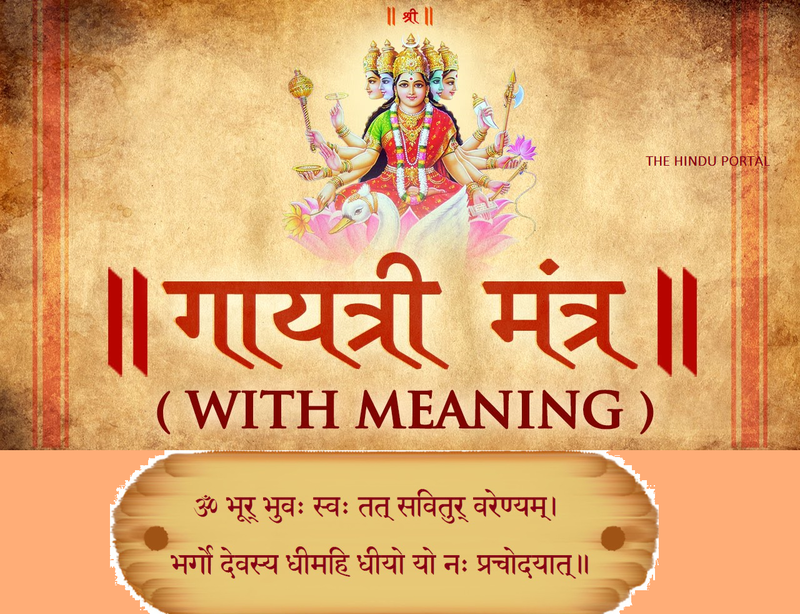 Gayatri Mantra: According to the Hindu scriptures Devi Gayatri is the Mother of the Vedas. It is said that even Trinities (Brahma, Vishnu, and Shiva) worship her as their Mother. Gayatri Mantra is the prescribed daily mantra for all Hindus and regarded as the remover of all sins and the bestower of all desired things. It is also part of the Sandhya Vandan. following is the most commonly recited Gayatri Mantra. We contemplate the glory of Light illuminating the three worlds: gross, subtle, and causal. I am that vivifying power, love, radiant illumination, and divine grace of universal intelligence. We pray for the divine light to illumine our minds. According to the Hindu belief, there are fourteen worlds. Bhu, Bhuvah, Svaa, Mahaa, Janah, Tapah, Satyam are the seven Higher worlds and Atata, Kutala, Vitala, Mahatala, Rasatala, Bhutala, and Patala are the seven Lower worlds. The above Gayatri mantra is recited by those seeking the Higher worlds.